There is a lot of evidence that S&OP is hard to implement and get right. And when S&OP is implemented it often stalls, doesn’t make enough progress and doesn’t deliver enough value. The reasons are plenty, but one of the core reasons is the lack of senior leadership support. Another reason is that employees just get tired of an overly dogmatic, bureaucratic process and data focused monthly cycle. Maybe at the start of the S&OP project executives buy in and employees are still eager. Usually lead and motivated by supply chain who promises a great business governing model, there is some enthusiasm and support from other functions. But over time when results are not what was promised, or when the resource drain starts to conflict with other priorities, the support drops. Without a clear ‘why’ to support S&OP, executives and employees will lose their interest over time. This is why S&OP needs to become more meaningful, provide goals beyond the usual S&OP KPIs, and provide an S&OP ‘why’ to both executives and employees. Philosophers have debated meaning and purpose for centuries. I won’t dig deep in to that, but Friedrich Nietsche’s ‘He who has a why to live for can bear almost any how’ explains nicely how meaning helps us stay resilient to overcome obstacles. Simon Sinek’s popularised finding meaning in his 2011 book and Ted Talk ‘Start With Why’. He called his idea ‘the world simplest idea’ and introduced that ‘people buy why you do things not what you do’. With 3.9 million Youtube views and millions of books sold he obviously hit a nerve. Finding your ‘Why’ became mainstream, but his idea was far from new. From business perspective, the 1996 HBR article from Collins and Porrass; Building your Companies Vision describes how successful companies have a reason d’etre, or a bigger purpose, a Why. And a lot more evidence on the impact of meaning can be found in the discipline of psychology. Martin Seligman, pioneer of the positive psychology movement, writes in his 2002 book ‘Authentic happiness’, that there are three levels of happiness. The pleasant life, the engaged life and the meaningful life. Only the meaningful life, where you use your signature strength in the service of something larger, will lead you to authentic happiness. The founding father of positive psychology was Abraham Maslow. He studied the traits of people that were self-actualised, which was the highest order in his 1960’s hierarchy of needs. These people feel themselves, safe, not anxious, accepted, loved, loving, and alive, certainly living a fulfilling life. His subjects had a mission to fulfill in life or some task or problem ‘beyond’ themselves to pursue. They had meaning. Unfortunately, less than 1% of us is self-actualised. It takes a lot of searching and hard work to get there. Vikro Frankl was an impressive man and author of the 1946 book Man’s search for Meaning. As survivor of the holocaust he realised that most survivors in the camps had one thing in common; meaning. He developed a psychotherapeutic method; logotherapy, which involved identifying a purpose in life to feel positively about, and then immersively imagining that outcome. Read this short book. Frankl wrote it in two days and it is one of the most impactful book I ever read. As the above shows, meaning, a purpose, or a ‘Why’ has been around for a while and is related to business success as well as personal resilience, survival, success, well-being, happiness and life satisfaction. What goes ‘beyond’ S&OP, or at least beyond the ordinary S&OP goals we set? The often supply chain oriented S&OP objectives like forecast accuracy improvement and inventory reductions will not really engage executives deeply. Neither will more advanced S&OP goals as EBIT or cashflow accuracy. It will not likely provide real meaning to executives, or anybody working in the S&OP cycle. What follows are examples on how S&OP objectives can be shaped to provide more meaning. Increase employee engagement: In 2016 in the US, 33% of employees were engaged, 51% were not engaged and 16% were actively disengaged (Gallup, 2017). As I point out in this Foresight article, if outcomes – like performance versus budget and strategy status – are clearly communicated to employees, business goals are better understood, and employees get a clear idea on how their role contributes to the strategy. These potential S&OP outcomes, are among the most impactful employee engagement drivers (HBR, 2013). Provide a clear future direction: Only 22% of US employees strongly agrees that the leadership of their organization has a clear direction and only 15% strongly agrees the leadership makes them enthusiastic about the future (Gallup, 2017). S&OP done well should improve this measure dramatically, impacting employee clarity, engagements and effectiveness with it. It is an objective easy enough to measure. Increase team effectiveness: When senior leaders improve trust behaviors as part of an S&OP implementation, they increase psychological safety, a shared belief where team members feel accepted and respected. A study by Google of over 180 organizations reported that psychological safety is by far the biggest contributor to team effectiveness (Rozovsky, 2015). My own research shows that S&OP is more effective where team members feel they can challenge each other and the status quo. Increase employee well-being: Compared to low-trust companies, people at high-trust companies report 74% less stress, 106% more energy at work, 50% higher productivity and 29% more satisfaction with their lives (Zak, 2017). Integrating trust behaviours, training & development with your S&OP implementation is a no brainer. Leading trustful executive S&OP meeting improves not only S&OP effectiveness, but also team effectiveness and employee well-being. Monetise the platform for collaboration: Benefits of collaborations are well documented. S&OP provides a platform for collaboration; however, this doesn’t mean employees will start to collaborate once the S&OP process is implemented. Research shows that 30% of people are selfish and 20% are takers rather than givers. These traits are not conducive for effective S&OP and you can address them as part of your S&OP implementation. Be aware that these examples would give me more meaning. You have to figure out what gives your company meaning, something that can be measurable influenced with S&OP. However, if you agree with these examples, you can use them to create more meaningful objectives when implementing S&OP. Including these in your ‘why’ for S&OP, will increase executive engagement, employee and functional willingness and endurance to support S&OP, and therefore overall S&OP resilience in your journey to excellence. Based on the the 1996 HBR article from Collins and Porrass, I developed an integrated planning framework, which I describe in detail in this blog. The framework can be used to incorporate your S&OP purpose/meaning and include guiding values and behaviours. 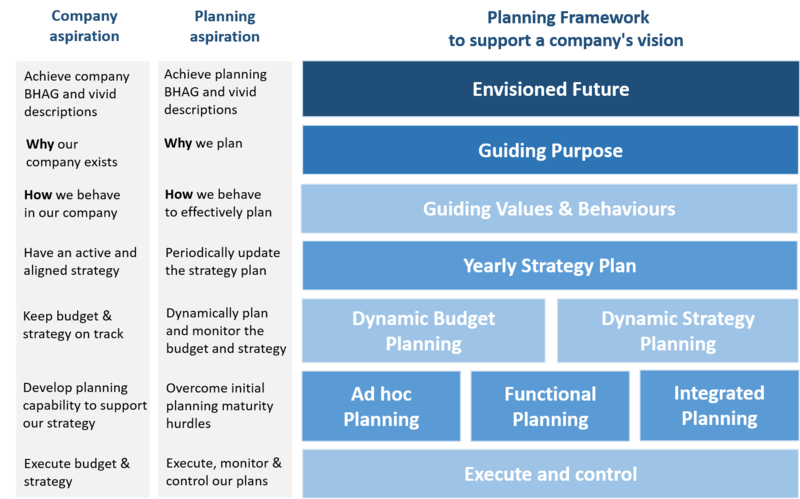 It further provides some S&OP maturity references to move from functional planning to dynamic strategy planning. To increase employee engagement and to provide a clear future direction, S&OP requires a certain maturity level which includes dynamic budget and strategy planning. However, once we understand this also improves employee engagement, it becomes a more meaningful S&OP objective to pursue. And our why to get there can bear almost any how. Once you define meaningful S&OP objectives like this, there is no excuse for an executive, not to be engaged with S&OP. And a planning community who not just improves accuracy, but plans to shape the business future in order to deploy strategy and increase employee engagement, will likely be engaged, jump out of bed every day, and go the extra mile to make a difference.